Draft Paliano Vanguard face up. 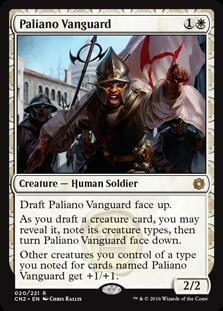 As you draft a creature card, you may reveal it, note its creature types, then turn Paliano Vanguard face down. Other creatures you control of a type you noted for cards named Paliano Vanguard get +1/+1.